is this diagram from the tiger/wildcat manual incorrect? they show the halyard go past the block and to the top of the mast. Shouldn't it simply go through the pulley and back down the mast to the cleat on the mast? 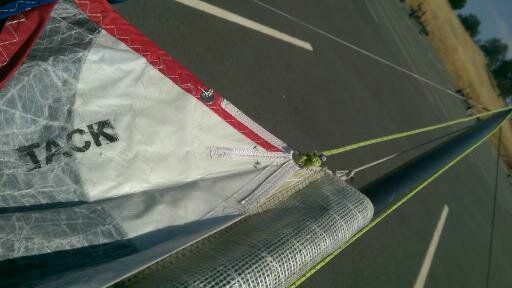 Also, are you not supposed to knot the halyard off at the final point on the spinnaker? Does the tack line use the block in the middle of the pole? if not, what is this block for? For rigging the tack line, after it goes through the cleat on the front crossbar and then through the trampoline block, where does it go? Through a grommet in the tramp? Just left on the tramp? Take a look at these two videos. they may answer some of your questions. is this diagram from the tiger/wildcat manual incorrect? I believe you are looking at page 30 in the tiger assembly manual and the yes the picture is not totally correct. 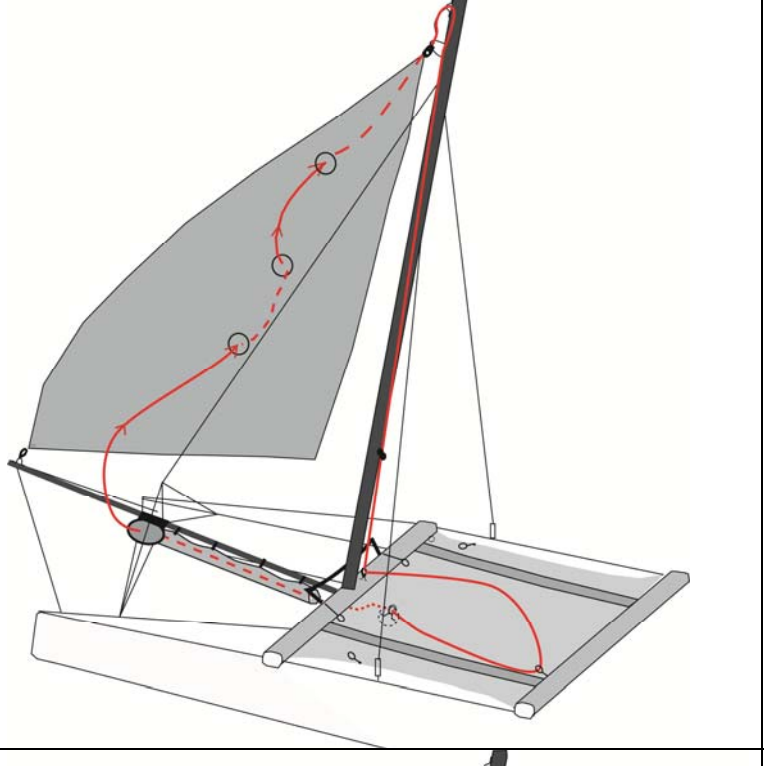 The SPI halyard connects to the sail head goes through the top mast pulley (not the top of the mast) then down (see page 29 & 30 for two separate systems) and circles around where the other end finally ends at the top retrieval point on the SPI. See the second video. This SNU System H20 diagram might also give you some ideas. Stags209 where do you live? Thanks for all the help Cork Guy. I have the system pretty much figured out. Tack will go through a swivel cleat on the front crossbar. Only question that still remains is, does this line just sit on top of the tramp? or do people run it somewhere else? I am using the SNU system for the halyard. cleat on the mast, stand up blocks on starboard and port front cross bar (so no holes through tramp). 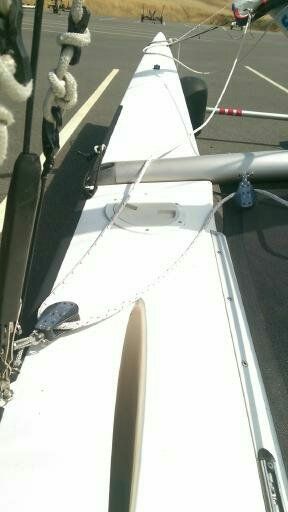 halyard with run from port crossbar down and through snuffer. For the turning block (is that what the ring/block on the shock cord is called? ), any advantage for using a block or a ring? I was planning on using a block. I am also using SNUs instructions for the halyard block/bail. 60" down through the sail track, eyelet at top of mast. So the only block on the pole will be at the tip of my 11'-6" pole. then and eyelet in the middle right on the forestay for tying the pole. I plan for all my pole bridles to be amsteel. 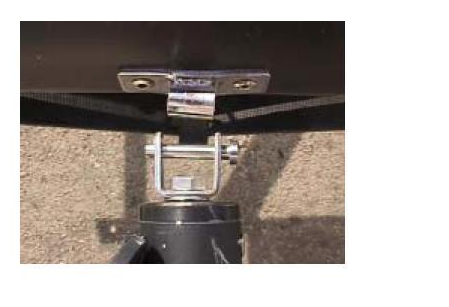 I am looking to see if a hobie dealer can supply me with the pole attachment hardware for the front crossbeam. Otherwise I and fabricate one myself or find an OTS part that would work. Just need the part that connect to the crossbar. I sail out of Spring Lake beach. 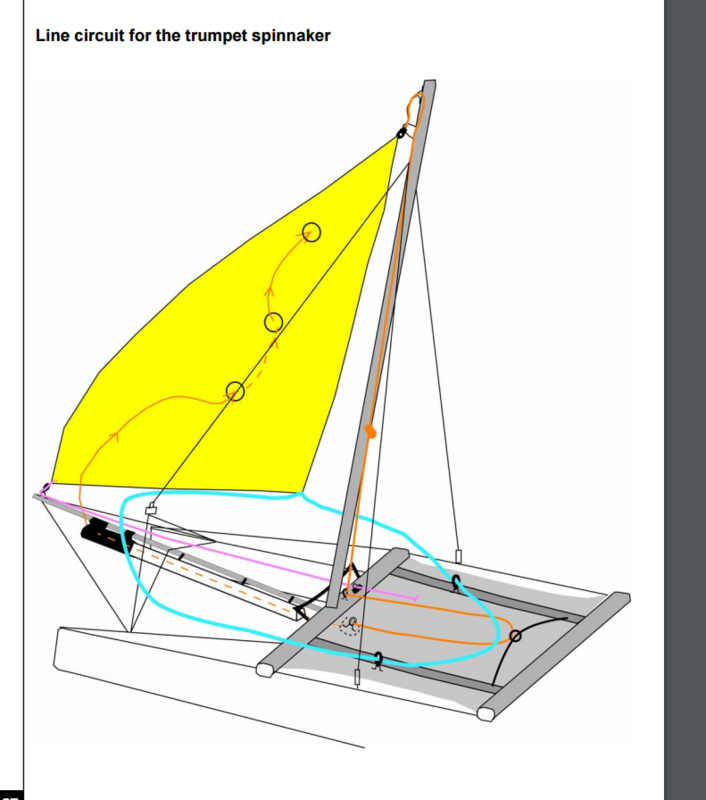 http://www.fleet944.com first boat to get a spinnaker so thats why i am bothering you guys instead of the fleet haha. For the turning block (is that what the ring/block on the shock cord is called? ), any advantage for using a block or a ring? I was planning on using a block. No the the turning blocks are used on the Spin Sheet see below how I have them rigged on an H18. I would recommend use at lease one ratcheting block on each side for your crew's comfort. On my H18 I my system is more like page 29. See second block on rear or spin pole. I also run the line threw my tramp to a block connected (with a short bungee to take up the slack) near the rear crossbar. Less line on the top of the tramp is better in my opinion. You might want to move this conversation to the H20 section to ask how they H20's manage their lines and connections. This weekend I will be rigging my 2004 Tiger for the first time and will be looking for ways to route as much line as I can to underneath the tramp. the way you have it rigged combines the tack and the halyard. I want to keep them separate. That is the "newer style" that the tiger/wildcat switched to. So the turning blocks are the blocks that run to the front crossbeam. Got it. I still plan to run it the older way by just sheeting at the one ratchet block on the jib track. So i sailed my h20 with the f18 spin a few times now. The issue im having is that the spin seems to be collapsing too often. is this a sheeting problem? luff tension? sheeting angle? here is a video of us running the spin. From what I can see, it's luff tension. There shouldn't be much sag on the luff at all. It's hard to get it that tight - but it should be tight on shore when you hoist it. 2 more cents from watching the video and your prior pictures, I agree the luff should have more tension. 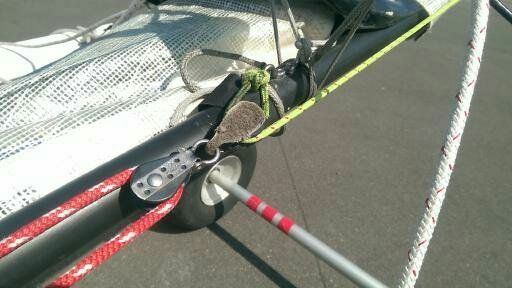 My first observation is the knot you are using for the outhaul to Tack is not allowing the sail to reach the forward pulley. You are giving up 4 inches, this should be shortened up. 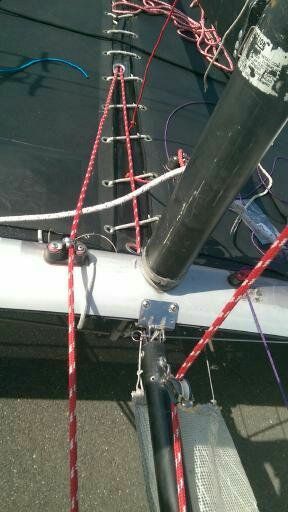 Second it looks like the Tack line you have chosen stretches under load (youtube video), in the video it appears to only stretch a couple inches but if you are using this same line for your spin halyard then the stretch could be causing some of your problem at the top end (hard to see from the skippers seat). Lastly it looks like the spin sheet bridal is about twice or three times as long as it should be. Maybe try adjusting there also?